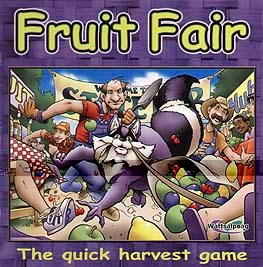 The orchards are ripe with fruit, and you can be the first to pick them and send them to the fair. Secretly assign your pickers and gardeners to the apple, cherry, plum and lemon trees. Watch out for the raccoon, or your pickers may return empty handed. Whoever has the most of each fruit gets a special benefit, and every turn there are difficult decisions to make. Do you send fruit to the fair to win the best prizes before another player gets them? Or do you keep them for another turn and use their special benefit to help pick more fruit? In the end the winner is the player who has earned the most valuable prizes from the Fruit Fair.